and a calming environment ensure an unforgettable spa experience. and blossoming orchids evoke an exotic touch. 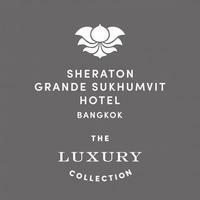 Located on the third floor of the Sheraton Grande Sukhumvit, The Grande Spa offers an abundance of amenities designed to enhance every treatment. Two of the 10 treatment rooms are dedicated to hydrotherapy—surrounding guests with the purifying benefits of warm water and steam. an even more exclusive level, with its own sauna and spa bath. Guests of The Grande Spa may also enjoy the separate suites of steam rooms, saunas, and Jacuzzi's in the Ladies’ and Gentlemen’s changing rooms. Plush towels, pure cotton bathrobes and slippers and water. therapists to introduce guests to the vast menu of wraps, facials, scrub, baths, massages, and lavish beauty rituals.